World wide communion Sunday takes on new meaning when hearing a Russian minister proclaim the gospel and testify to God’s transforming power in his life. 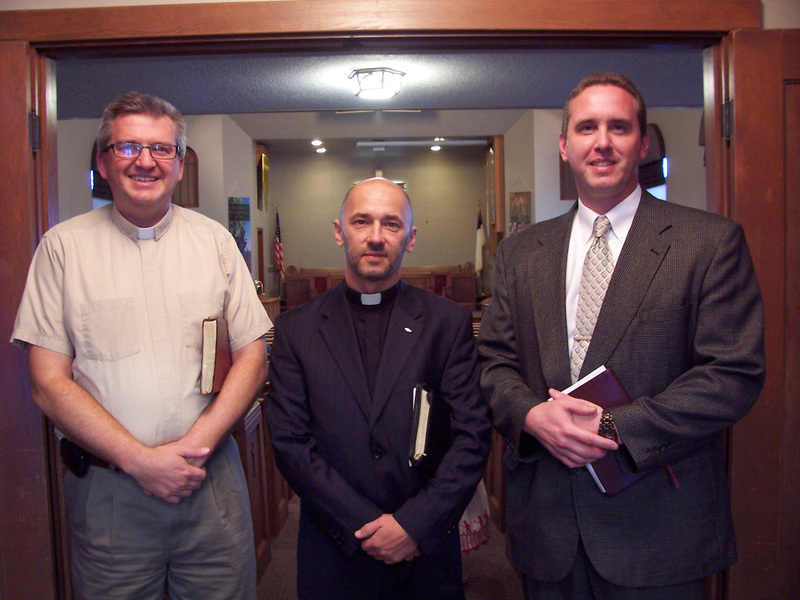 On October 2, 2011, Rev. Ruslan Moroz spoke at the morning worship service of Christ the Redeemer Church (CREC) in Pella, IA, and at the evening service of Ebenezer Reformed Church (RCA) in Leighton,IA. Rev. Moroz is associated with the Slavic Reformation Society and was in the United States because his congregation, the Christian Presbyterian Church (Light of the World), hoped to become part of the CREC, whose General Council was scheduled that same week. On Sunday evening in Leighton, Pastor Mark Jicinsky (Ebenezer Reformed Church) welcomed the many visitors to his church and opened the service. He emotionally related his personal journey of faith, which began with an idyllic childhood as an only child. His mother and grandmother brought him to an Orthodox church for baptism when he was five years old, but the only additional Christian influence during his childhood was observing the quiet devotion of his other grandmother. When Ruslan became an adult, he served two years in the army and two years as a sailor. He married, but was not “serious about life.” Then his country experienced the turmoil of the 1990s when communism fell. A crippled government and economy made life difficult for many people. Ruslan and some friends had a highly successful car import business, but he “hit rock bottom.” He and his wife divorced and he lost everything, including contact with his children. During these hard times, many people began attending church and became believers. Missionaries from Japan and Korea, especially from Korean Presbyterian churches, were active in Eastern Russia. “That was my first meeting with Jesus,” Ruslan said. He tried returning to his old friends and lifestyle, but God placed roadblocks along that way. Instead God led him to get a new job and to seek reconciliation with his family. He eventually remarried his wife and lived with her and their children. Ruslan felt called to attend seminary, but had to leave his newly restored family for two years in order to do that. When he returned, he preached in the village and prayed for five years for God to establish churches along a long empty road. A church in Korea donated money so that Ruslan’s small church could construct a building, and the congregation grew from three to forty people. The empty road now has two churches. There are 32 churches and four Presbyterian pastors in the area. This progress came with a price, however. Ruslan’s wife lived and worked 100 km away in the city to support the family, while Ruslan lived in the church in the village. About a year ago, Ruslan attended the Slavic Reformation Society seminary in St. Petersburg and learned new aspects of Reformed teaching. He heard about the biblical roles of a husband and pastor. Ruslan’s new appreciation for God’s covenantal faithfulness became more meaningful when he recently baptized his grandson. The above article by Glenda Mathes appeared on page 12 of the October 26, 2011, issue of Christian Renewal.